So speaks Lloyds of Indiana President Gary Jones, who enumerates the reasons why ID badges and ID cards have become nearly a necessity in today’s world. Personal safety and corporate privacy cannot be over emphasized in the world today, yet some companies still function without the simplest form of assuring that the person who is inside their building really belongs there. Keeping your visitors, employees and your records safe from harm is critical. One of the best ways to accomplish this task is to use ID badges for your employees and visitors. Using ID cars and ID Badges to identify your employees is not new to business. In the past, badges were used only for high security positions, conventions or larger parties. In today’s business world, ID badges are simple common sense – primarily because the cost of professional grade ID printing equipment has fallen dramatically. The image of being a secure facility, who takes their business seriously and wants their employees to do the same is enhanced by the use of ID badges. ID badges don’t just control who enters and leaves your building. Professional ID badges help assure your customers that your employees are knowledgeable and capable of helping them to transact their business with your company. More importantly, they assure the customer that your employee is your employee Hospitals, larger companies and even small ones who use outside sales people, or have a great many visitors find this method of keeping track of who’s who and where they are convenient as well as necessary. ID Badges, whether or not we pay attention to them, provide us a very real form of security that has become so important in recent years. We often take for granted that the person who works on us in the emergency room is really a nurse, but without that ID badge attached to her uniform, would we be so certain of her skills? Visitor and guest passes serve to assure your employees that guests belong in your building. When a visitors pass is given, the employee has the means to be able to ask to assist a customer to the facility, or to assure that he or she has everything they need while they are there. The customer’s being able to view who it is they are dealing with, very often will prompt the employee to provide greater service than if they were anonymous to the visitor. Additionally a quality ID badge permits the employees to see who is a visitor and to assure that they can report any behavior or activity that is suspect. Company employees may be charged with questioning politely those who are not wearing an id badge and asking them how they may help them, which will provide for greater security within your facility. With today’s ID Badge Printers and ID Printing Services, price is no longer an excuse for not having a quality ID badge program. 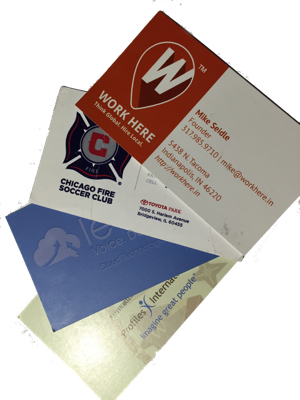 There are several methods of printing ID badges, but by far the most superior is the Dye sublimation printer. Dye sublimation printers like the Fargo Persona allow you to print photo quality images for your identification badges. The main difference between inkjet, which affords a low quality image and the dye sublimation printer is how the colors are applied to the paper. Inkjet printers are laid down in individual dots which, when viewed up close show up as individual single color dots, making the images less than crisp and clear. Dye sublimation lays down the colors in a solid dye, which mixes the four main colors that are used in printing. As it prints the heads of the printer will heat to pass over the colored film, making the dyes embedded there vaporize, so that they will actually permeate the id card blank creating a far crisper and cleaner image. Inkjet printers create an image like the picture you see on TV versus dye sublimation that produces quality more similar to a photograph. When the Id Badge has been printed, an additional feature which will provide for greater security is the application of a holographic seal over the id card, using what is called an overlaminate. Aside making your badge look more official, it makes the id badge harder to counterfeit. 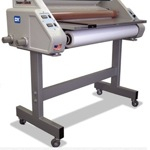 Many ID Printing systems support automatically applying an overlaminate as part of the printing process. Another of the more useful features which may be added to an id badge is the ability to store data on a magnetic stripe or in a proximity chip. Magnetic stripe cards can be swiped like a credit card to provide data such as an employee number, name, id number or other identity data to the machine that will read it. When swiping a card isn’t practical, a proximity card, which will use radio waves to communicate with a sensor, can do the job. Equipped with a tiny proximity chip, a “prox card” is read when within a certain distance of the receiver. distances sometimes several feet, or perhaps only an inch or two away, the system will confirm the signal that is being offered belongs to a person who has a right to be in this given area. The access system will then provide access to the building or a particular area of the building to those who are authorized to be there. You can find the means to learn about and to implement some of this this much needed technology for use in your ID badges by a visit to Lloyds of Indiana, at http://www.lloydsofindiana.com. When you decide the time has come to protect your employees and secure your facility there is no one more qualified than the team at Lloyd’s of Indiana to help you do it well, furnishing everything your company will need, at a cost that might just surprise you. We purchased a fargo 5000 badge printing system from lloyds of indiana, Our company produces and resells membership cards and corporate id’s. The fargo prints great barcodes and encodes magnetic strips on the back of the badge. I would reccomend this to anyone with profits on thier mind! Our facility is HID proximity secured and we use a badge system to control our employee access and time and attendance. The proximity cards we use have visual image on the front and HID security for door access. Lloyds made this so simple for us to install this complete system and help us intergrate this with our existing alarm and time and attendance system.